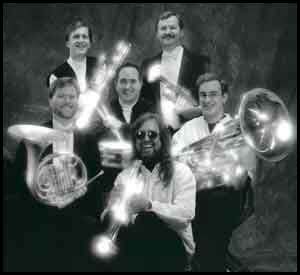 The Keynote Brass consists of six professional musicians who hail from the greater Indianapolis area. Since its inception in 1993, the ensemble has been heard in concert throughout the Mid-West. Keynote musicians have performed with major symphony orchestras in Indianapolis, Boston, Cincinnati, Hawaii, Dallas, Fort Worth and London. They have also appeared locally with the Indianapolis Chamber Orchestra, the Anderson, Lafayette and Terre Haute Symphony Orchestras and the Fort Wayne Philharmonic. When not performing with the ensemble, Keynote members remain active as free-lance musicians, recording artists and teachers.